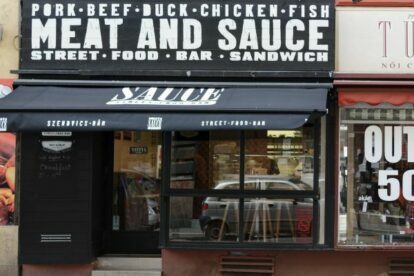 There is a place near the Opera in Budapest that will provide you with the experience of deliciously saucy meat that you will eat until its sauces comes dripping down your elbows: the name is Meat and Sauce! No matter what type of meat you prefer, they have it all: sous-vide roasted beef, pork, confit duck, but also chicken and fish. You have a choice between a whole-wheat ciabatta or white bread that will welcome the meat, then the meat-sauce is added to soak the whole sandwich in even more deliciousness. As this kind of meal really has the potential to stain all your clothes, it is highly recommended to be eaten while seated. Meat and Sauce has a few chairs for you to do so but you can also ask for takeaway and search for a sunny spot at the nearby squares. But please, bring napkins! A confession: these sandwiches are so filling that until today, I have never been able to finish the whole thing at once. I save it for later, but you also have the possibility to ask for half a sandwich, also available in menus including a different soup and dessert every day. Latest news: Meat and Sauce now offers breakfast food, that is: an English breakfast sandwich, ham & egg bagel and American-style pancakes. You really should give it a try!